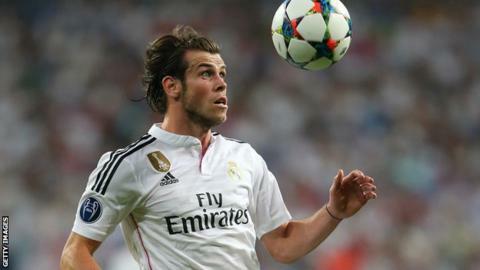 Crystal Palace midfielder Joe Ledley says the media have been tough on Wales team-mate and Real Madrid winger Gareth Bale. Bale missed several chances during Real Madrid's Champions League semi-final loss to Juventus on Wednesday. The 25-year-old received criticism from his own fans and has also faced negative comments from sections of the Spanish media this season. "Everyone's been very harsh on him," Palace midfielder Ledley, 28, said. Bale is the world's most expensive player after he was signed in a £85.3m deal from Premier League side Tottenham in September 2013. The ex-Southampton trainee scored 24 goals in 46 games during his debut season in Spain, helping Madrid win the Champions League and the Copa del Rey. But he has endured a difficult second season and was whistled by some fans during Real's 1-1 second leg draw with Juventus, which saw Juve progress 3-2 on aggregate. "Last year what he achieved was unbelievable - Champions League winner and you can't write a script for what he did," Ledley told BBC Wales Sport. "This season everyone's getting on his back and he's still got 15-odd goals and eight assists. I would take that all day, anyone would. "People just want more and more and for me he's just brilliant. "A team like Real Madrid are lucky to have a player like Gareth." Bale says he will return stronger for Real Madrid next season and Ledley added that his international team-mate can cope with the criticism. Both players will be part of the Wales squad for the crucial Euro 2016 qualifier against Belgium at Cardiff City Stadium on 12 June. "That won't phase him at all," Ledley said of the criticism. "He'll just go out there and perform and sooner or later he'll start finding the net and he'll go on another run. "Hopefully that will be very soon and we all look forward to meeting up with Gareth. "He's a great lad and we all get on with him really well."